While diamonds are a girl’s best friend, diamonds usually aren’t friendly to a girl’s wallet. Since getting my ears pierced a couple of years ago, I’ve been wanting to grow my jewelry collection from the couple earrings I got on sale at Macy’s, but it’s such a struggle to find items that I like at prices I could afford. The newly launched Ice provides beautiful jewelry pieces at a range of prices. They do have some “big budget” items that would be great gifts from significant others (*hint hint*) but also have cute earrings for under $30. 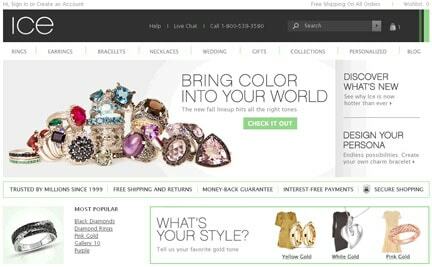 You can search through the wide variety of jewelry by type (earrings, rings, bracelets, etc. ), price range, birthstone, style, and a few other options making it easy for you to find that perfect piece of jewelry. Even better, Ice provides free shipping and returns, just in case that blue topaz isn’t quite the shade you wanted it to be. Ice has so many different styles, that you can find an item for any occasion – whether it’s a night on the town or just hanging with friends. They even have jewelry that you can customize. Make sure you check the “Now or Never” sections to get ridiculously low prices on their clearance items (like sterling silver diamond letter necklaces for just $19.) If you’re in the market for a new ring, watch, necklace, or other jewelry item – take a look at Ice’s collections to see if you see something you like. One winner will receive a $100 GC* to Ice.com! Leave a comment with the answer to this question: What is the Most Discussed piece of jewelry on the Ice home page? +1 if you follow Ice on Twitter. *Some exclusions apply. Not applicable on sale or clearance items, watches, engagement rings or The Persona Charms Collection. Not applicable on taxes or shipping costs, and cannot be combined with any other offer. Giveaway ends at 11:59 PM EST, August 25, 2011. Most Discussed piece of jewelry on the Ice home page is the Amethyst & White Topaz Silver Ring. Amethyst & White Topaz Silver Ring is most discussed. Amethyst & White Topaz Silver Ring. I like Ice on FB as Jay Cee and commented. I follow Ice on Twitter as bikeohio. Uh oh! My mandatory entry did not go through! The most talked about piece of jewelry is the Amethyst & White Topaz Silver Ring. It is the Amethyst & White Topaz Silver Ring. “Liked” Ice on Facebook as Georgia. I Liked Ice on FB…. most discussed amethyst and white topaz silver ring! The most talked about item is the amethyst silver ring. I like ice.com on Facebook as Patricia Edwards. The most discussed item is the Amethyst & White Topaz Silver Ring. The most discussed is Amethyst & White Topaz Silver Ring. This week our community is buzzing about the Amethyst & White Topaz Silver Ring. One of our best sellers. The most discussed piece of jewelry is the Amethyst & White Topaz Silver Ring! So pretty! The most discussed piece of jewelry is the Amethyst & White Topaz Silver Ring. The most discussed piece is the Amethyst & White Topaz Silver Ring. The most talked about si the Amethyst & White Topaz Silver Ring. The Amethyst & White Topaz Silver Ring is the “Most Discussed” I can see why, it is beautiful! Like Ice on FB and wrote on their wall. This week the Ice.com community is buzzing about the Amethyst & White Topaz Silver Ring. One of their best sellers! I like Ice.com on Facebook! I follow the WIC Project on GFC! I subscribe to the WIC Project by email! I liked Ice on FaceBook as Jess Lynn Hall. I liked the wic project on facebook as Jess Lynn Hall. Im following Ice on twitter as @luvmylacquer. i follow the wic project on twitter as @luvmylacquer. I subscribed to the wic project reader via google. My name is Jessica Hall. The most talked about is the Amethyst & White Topaz Silver Ring. Amethyst & White Topaz Silver Ring – and I can see why! The most discussed piece of jewelry is the Amethyst & White Topaz Silver Ring! The Amethyst & White Topaz Silver Ring is the most discussed. I follow the Wic project with Google Reader. They are buzzing about the Amethyst & White Topaz Silver Ring. The Amethyst & White Topaz Silver Ring. As of Monday 8/22, it’s their Amethyst & White Topaz Silver Ring. Like Ice.Com on FB (Contest KAO). Thanks. Like WIC on FB (Contest KAO). Thanks. The Amethyst & Wite Topaz Silver Ring is the most discussed. The 4 3/8 Carat Amethyst & White Topaz Sterling Silver Ring is the most discussed. thank you!! The most discussed was the Amethyst and White Topaz sterling ring but all I’ve been discussing is the heart handcuff pendant since I saw it LOL It’s soooo cute! Amethyst & White Topaz Silver Ring isthemost discussed. I believe it is the Amethyst and White topaz ring! MOST DISCUSSED is the Amethyst & White Topaz Silver Ring. The most dicussed piece of jewelry is the Amethyst & White Topaz Silver Ring. Thanks. The most dicussed piece of jewelry is the Amethyst & White Topaz Silver Ring. Hello. The most discussed item is the beautiful Amethyst & White Topaz Silver Ring. Oops, I liked you under Jessica L. Fredette. The most discussed piece of jewelry is the “Amethyst & White Topaz Silver Ring”. Most discussed ring is the Amethyst and White Topaz Silver Ring. The most discussed item is the Amethyst and White Topaz silver ring. The most discussed is the Amethyst & White Topaz Silver Ring. The most discussed piece is the Amethyst and White Topaz Silver Ring. I like Ice on facebook as Alison Faith Tolar. I follow Ice on twitter as @AFTolar. Amethyst & White Topaz Silver Ring! I like ICE on Facebook! The most disscussed is the Amethyst & White Topaz Silver Ring. Hi there the most discussed piece is the amethyst and white topaz silver ring.Thanks and have a great day!! Amethyst & White Topaz Silver Ring is the most discussed. Amethyst & White Topaz Silver Ring, thanks! MOST DISCUSSED: This week our community is buzzing about the Amethyst & White Topaz Silver Ring. I “like” Ice on Facebook. I “like” The WiC Project on Facebook. My FB name is Gaye M (and I forgot to include that in my previous post). The Amethyst and White ring. Most discussed jewelry is: Amethyst & White Topaz Silver Ring. It’s the Amethyst & White Topaz Silver Ring. The Amethyst and White Topaz Silver ring is the Most Discussed piece of jewelry on the ice.com home page. Thanks!